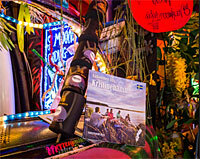 Gothenburg restaurants - go for a bite to eat in Goteborg. 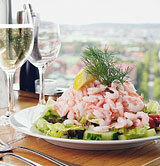 In Gothenburg you can eat wonderful seafood because of the closeness to the sea. There are a wide variety of restaurants from the simple to the finest available in the Guide Michelin. Below you will find some restaurant tips! 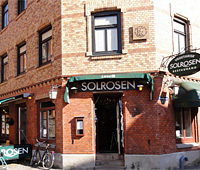 In the old part of Gothenburg in the Haga area you find the vegetarian restaurant Solrosen (Sunflower). Here you can dine lunch and dinner in the evening. Some vegan dishes are also served. Very good salad buffet and great prices on beer. Simple spartan furnishings. Not so many dishes to choose from but otherwise it's good. In summertime you can sit outside. Would you like to eat a lot of quality food, we highly recommend 28+. The restaurant opened 1985. You are greeted by a simple environment with a vaulted cellar, whitewashed walls. When going here, take your time and try their whole huge menu with 5-8 dishes. Their combinations of food and wine is perfect! The service is fantastic. Their desserts just melts in your mouth, why not try their wonderful cheeses. The interval is long between dishes, it is good, to be able to digest and discuss what you have just eaten and then be prepared for the next wine and dish. The grill is in focus at the restaurant Barabicu. A lot of dishes is grilled over an open fire in the South American way (grilled the asado way). Here you can eat burgers, rib, steak, tuna, pizzas and sea fish and oysters! Are you more than 6 people you can share a whole roasted suckling pig. At the bar you can choose one of their good coctails - on the rocks, on crushed ice or served long. Summer time you sit outside on the sunny side and looking out over the canal. 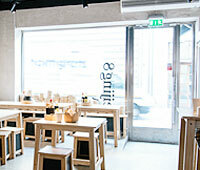 This Korean restaurant started in Gothenburg in 2009. How about kimchi, bibimbap, seaweed noodles and kodjochang. This is where the majority of foreign tourists visiting in Gothenburg. Those who come to visit are from South Korea, China, Malaysia, Vietnam, etc. The kitchen has a chef from Korea who has many years of experience cooking in Malaysia. Vegetarian and vegan dishes. Buffet lunch and dinner in the evening. Japanese food is also served. Wonderful fresh and tasty food. 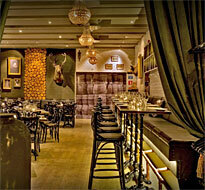 Do you love thai food, do not miss this lovely restaurant a few walking steps from the Avenue. When you come into the restaurants, it feels as if you have come to Thailand in five minutes instead of flying several hours. Good food and wonderful decor. Take the kids with you, they will love it. If you love wine this is where you should go. 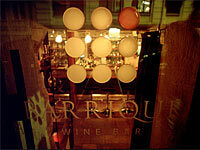 At Barrique there is a wide selection of wines served by the glass. Their goal is to introduce the wine in different contexts, such as wine tastings, by guest chefs and with unique wines in their special wine machine. On their a la carte menu, you can choose half portions and they have hot hors d'oeuvres, cheeses, hot dishes and desserts. Go here if you want to feel a little luxury. 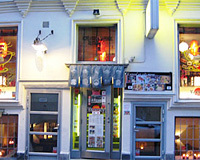 Located in the city center of a road parallel to Avenyn. Please visit Pivo as a restaurant both inside and out. In summer it is really nice to sit outside and why not test to play some boules. Cozy interior. 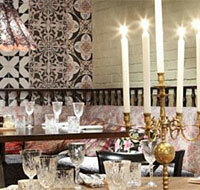 Cosy restaurant specializing in Italian food good. The restaurant has good food, and why not take in several dishes and share. Central location. Do not forget to book a table. 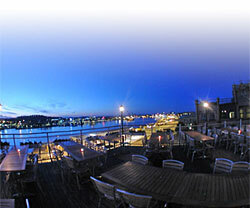 More tips about restaurants in Gothenburg!! Dumplings for every penny. Why not try something that you may have eaten several times abroad. Try the good dumplings with filling such as salmon, duck, chicken, etc. 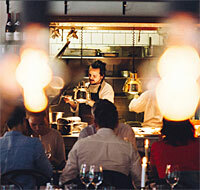 The landlord is Michael Ljunggren who has driven restaurants in Stockholm. Absolutely gorgeous combinations eg salmon and saffron! Quality is what counts here for the ingredience! Want to bring with you dumplings home to your own steamers - that is ok! Lunch and Dinner served. Good prices! Here, you eat hamburgers and "weeds". The weeds are not common grass - but pie or salad! Mayonnaise is their own, the cheese is from Sivan Osthandel and the meet is grind at onsite. For those of you who dig the American Way, take a milkshake with your meal. How about strawberry and thyme or basil! Exciting. If you do not want to eat the burgers, have a drink in their bar and order a cheese plate. 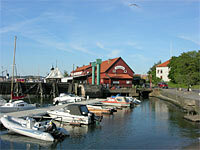 Of course, we must write about one of Gothenburg's characteristics - Sjömagasinet. 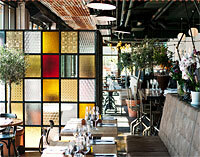 The restaurant is located at the harbor entrance, "Klippan", and the premises is dating back to 1775 and was then used as a warehouse for The Swedish East India Company. Their speciality is of course fish and shellfish. 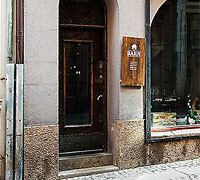 Would you like to visit a genuine old restaurant with great atmosphere and wonderful food - do not miss Sjömagasinet. The restaurant got a Michelin star 1999. 2011 - lost its star due to change of owner. 2014 - the Guide Michelin star returns. Please go to this nice decorated restaurant and eat some goodies. You can get the weeks tartare. You can actually get steak tartare both as starter and main course. Testing something else like soup, crepes, entrecote, salads. For starters, you can choose some oysters with champagne. Restaurants a bit up high! 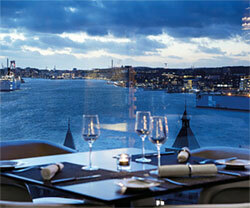 Here on the 12th floor, you can enjoy dinner and have an amazing view over the harbor entrance. Asian and European menu that varies according to the season. Large selection of wines. Do not miss their afternoon tea on Saturdays. 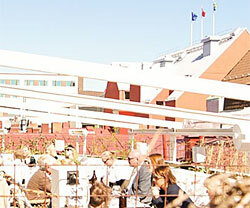 Do not miss the rooftop at Pigalle. It is open every day. During the summer it is really nice to sit up there amongst the rooftops. Don´t miss their Saturday brunch. The Hotel Gothia Tower elevator takes you up to the 23 floor. Here you can dine or just have a drink in their bar. 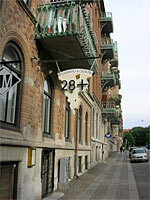 Heaven 23 opened in 2001. The view up here is fantastic, you look out over the Liseberg amusement park and the rest of the city. What shall you eat up here? They are known for their King Size Schrimp Sandwich .... be hungry when you get here. The King Size Schrimp Sandwich was introduced in 1984 when the hotel opened. It has been on the menu since. In May 2009 they sold the millionth sandwich. If you do not want a schrimp sandwich, you might choose a nice fish or meat dish .... yes, there are a lot to choose from. Upper House Dining is another restaurant that is located in the middle tower. Please visit the venerable Henriksberg in Gothenburg. Henriksberg was founded in 1874. Perhaps best known as a pub but they also have a restaurant in the house. Please visit their roof terrace and veranda. An absolutely stunning view of the harbor entrance. 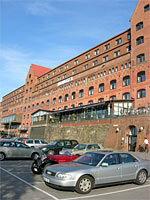 Novotel offers food in its restaurant Carnegie Kaj. From here you can get a view of Älvsborgs bridge. A long time ago ships unloaded their cargoes here. The name Carnegie comes from Scotsman David Carnegie Jr who owned the sugar mill and port brewery which was built here 1808. Here you can also have lunch. Outside you can go to Röda Sten and have a look under the Älvsborg bridge. Make a visit to restaurants that think about what food you eat. Not too much sugar in the food (which unfortunately is in thai food), vegetarian dish and always Pad Thai on the menu and much more delicious. Mikael and his wife who own the restaurant buy nice ingredients from Johan in the hall. You can also buy fast frozen food and eat another day. NOTE! No taste enhancer / Glutamate / E621 in their food.